The proposals put forward by the DfT for a high speed railine from London to Birmingham need to be looked at in detail. The entry/exit points to the two great conurbations leave at lot to be desired. The DfT has decided that the London terminus for the high speed line to Birmingham is to be at Euston. The present 14 platforms would be increased with another 10 in a major redevelopment. This would direct all the high speed services from Birmingham, Manchester and Leeds into Euston. The positive side to this, apart from the rights and wrongs of Euston expansion, is that there is a proposal to build a "people-mover" from Euston to St.Pancras/Kings Cross. We would argue that this is necessary whatever happens to Euston. 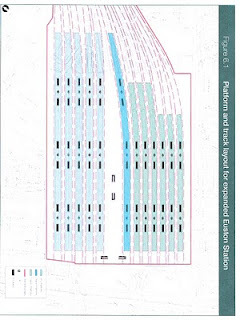 Even if the station stays the same size then a "people mover" (by which we understand to be a continuous walkway or horizontal escalator as is already used in large airport terminal buildings)would be essential to reduce demand on the underground/LUL for that one stop connection. The connection between the LUL Circle and Hammersmith LInes would also be helped and improved by a moving walkway from Euston LUL station to Euston Square. However, the need for such an increase in the size of Euston is very questionable which we will look at in a moment. 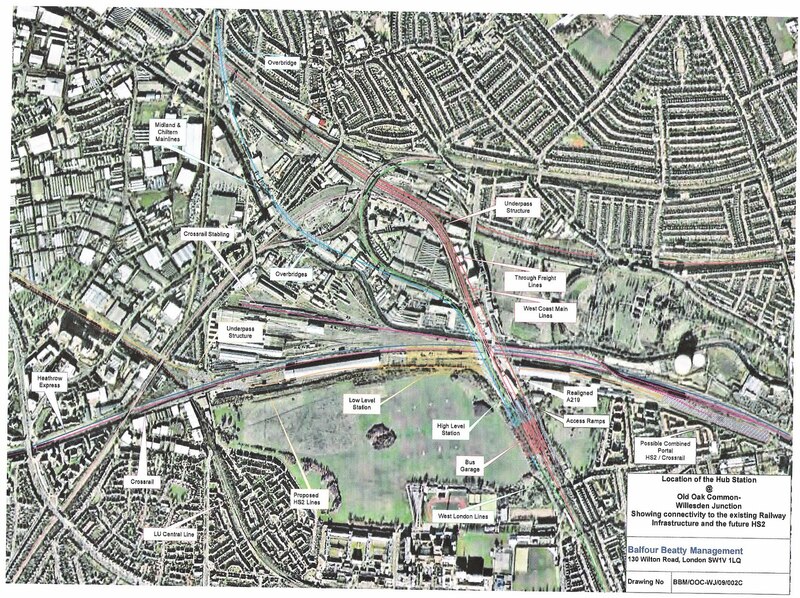 The intermediate stop in London before Euston is proposed at Old Oak Common. There are various reasons for this. (a) this is the entrance to the Crossrail tunnel under Central London to Liverpool St. and Whitechapel. (b)This way Heathrow Express(HE) and Heathrow Connect(HC) trains can interchange with HSR2 trains without passengers having to go into Central London. 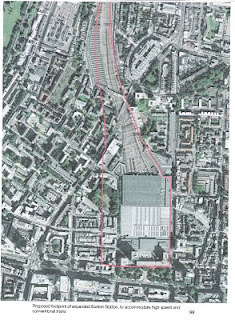 (c) There are direct connections with the "North Pole Depot" which is destined for Crossrail and/or HSR2 trains. This depot was previously but no longer used by Eurostar trains. (d)this "off-central" station will satisfy the demand for connections to Heathrow and to the GWML. 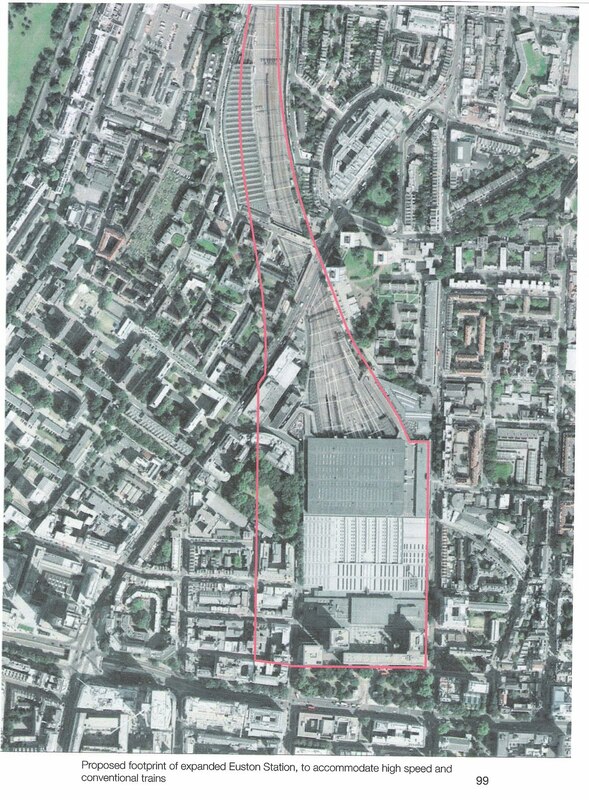 (a) why cannot we connect with Crossrail at Paddington itself without having an intermediate station? - meaning more lost time. (b) Cannot HE and HC services connect with Heathrow from Paddington? (c) If the "North Pole Depot" could be connected from Waterloo for the original Eurostar services, cannot it be connected to Paddington for the HSR2 services (and even in a better and shorter way). (d) Paddington already satisfies the demand for conections to South Wales and the West without the need to con struct an extra unnecessary time wasting expensive station in West London. Let us look at certain facts as already presented to us by the DfT through the report from HSR2 Ltd..(High Speed Rail London to the West Midlands and Beyond HS2) Demand Model Analysis. Heathrow, with around 2,000 passengers per day using HS2 to access the airport for international flights. This means that even a station at Heathrow which is deliberately modelled to maximise the attractiveness for airport passengers would represent less than 2% of the traffic on HS2". This, certainly, makes the case for a Heathrow Hub very tenuous to say the least. So what is the case for a NEW station in West London? basically it is non-existant. To use the present infrastructure is feasible, cheaper and more realistic. One problem to be raised is "Are there enough platforms at Paddington?" Abstracting the present Great Western Local services from Paddington and passing them directly to Crossrail would free up platforms at Paddington. Add to that the Heathrow Connect (HC) services (due to double to 4 per hour) plus the Heathrow Express services (HE) at 4 per hour then you can have enough services for Crossrail without cluttering up Paddington with local services - more than enough reason to make Paddington the London terminus for HSR2. Obviously, it has to be said that since the GWML is to be electrified then the surburban services to Henley-on-Thames, Marlow, Greenford would become feeder services for the main line stopping services as is the Windsor & Eton- Slough line at present.It is not feasible to electrify these branch lines for only 1 or 2 trains per hour. Thus a transfer on the main line to electric services would take place. The present proposals for Crossrail: envisage 24 trains per hour (max.) in each direction through the centre section from Paddington out to both Shenbury(12) and Abbey Wood(12) in the east.The train paths are more complicated towards the west. 4 trains per hour will be Heathrow Connect (HC) services to the airport, 4 will be stopping trains to Maidenhead and 2 more will only go as far as West Drayton. This means that 14 tph will only go as far as Paddington - rather a waste of resources.There is talk of Crossrail being extended to Reading. If this were so then the Great Western local services are logically the ones to be substituted. This would mean that the local services which, at present, run into Paddington would terminate on the main line. Thus the connecting pattern would be (a)Henley-on-Thames to Twyford (b)Marlow to Maidenhead (c) Windsor and Eton Central to Slough - as at present (d)Greenford to West Ealing. This would abstract 4 trains per hour from Paddington. If you add the HE services and HC services to run through the Crossrail tunnels then we calculate that 6 platforms can be freed at Paddington for other services. The need for more stopping trains to Slough, Maidenhead and Reading would have to be ascertained. The use of these freed platforms can be for new services to South Wales, the West and South West, or they can be used for services to Birmingham. 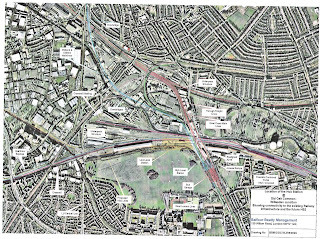 Therefore, if you have a direct connection at Paddington to (a) Crossrail (b) the GWML (c) Heathrow airport and (d) the West Midlands, what is the need for an expensive, time wasting extra station in the west of London?? and why run the trains into Euston when Paddington could suffice?? 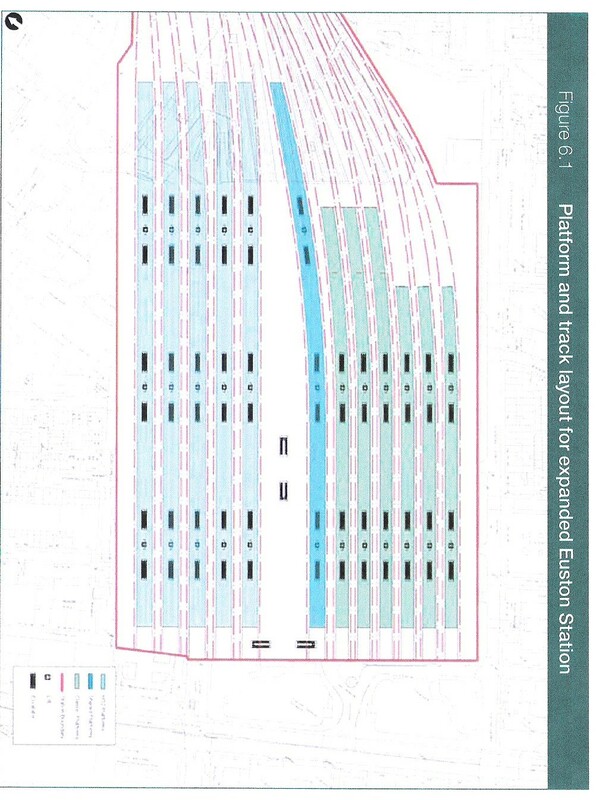 However, if an expanded Euston contemplates 10 extra platforms would those 6 Paddington ones be sufficient? It all depends if you want to run HS trains just to Birmingham or further north as well. In fact it has been shown that by using both Paddington and Euston there could be enough platforms. The most important report in this aspect is the ATKINS report to the DfT High Speed 2 Strategic Alternatives Study. This is basically a "do minimum" strategy taking advantage of the present infrastructure or with minimal investment. There are five packages, each building on the previous one. They range from "tweaking" the timetable enabling a "shoe in" of more services, to substantial investment for the e.g.avoidance of line conflicts or more four tracking etc.. Packages three and four are probably the most interesting since they result in substantial improvement without excessively large investment. The probable train service pattern is also illustrated. The two points which interest us most in this article are the fact that the London - Birmingham services leave from Paddington while the expansion to Euston is limited to three extra platforms within the present station footprint. In this model the Overground DC services from Watford still run into Euston. However, if the services were diverted either (a)from South Hampstead via Chalk Farm to Camden Road which would permit the trains to continue to Stratford or join the ELL at Highbury & Islington to south of the Thames, or(b) eliminate them as Overground services and make them Bakerloo Underground services. Abstracting these services from Euston would free up 2 more platforms for more regional and/or long-distance services. The ATKINS document does not assume that HSR" will be built but only uses present resources. With HSR2 built through the Chilterns then the benefits would be far greater. The essential works would be to ensure the connection from Euston to the Chiltern line, through Old Oak but without a station there. The entry into the West Midlands is something else to look at which we will do in the next blog.